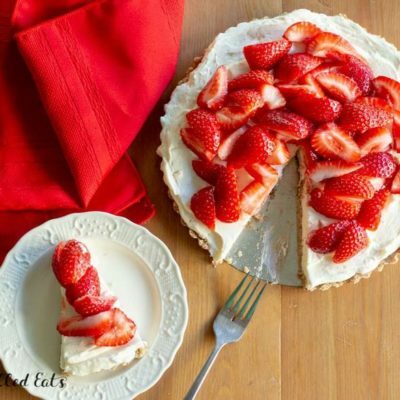 This is the easiest Strawberry Tart Recipe ever. With only 5 ingredients and about 10 minutes of prep time, you can still impress your friends and family. I know it’s October but my local farmer’s market had strawberries for .99 a pound and I just couldn’t resist whipping up one more strawberry recipe before winter comes. 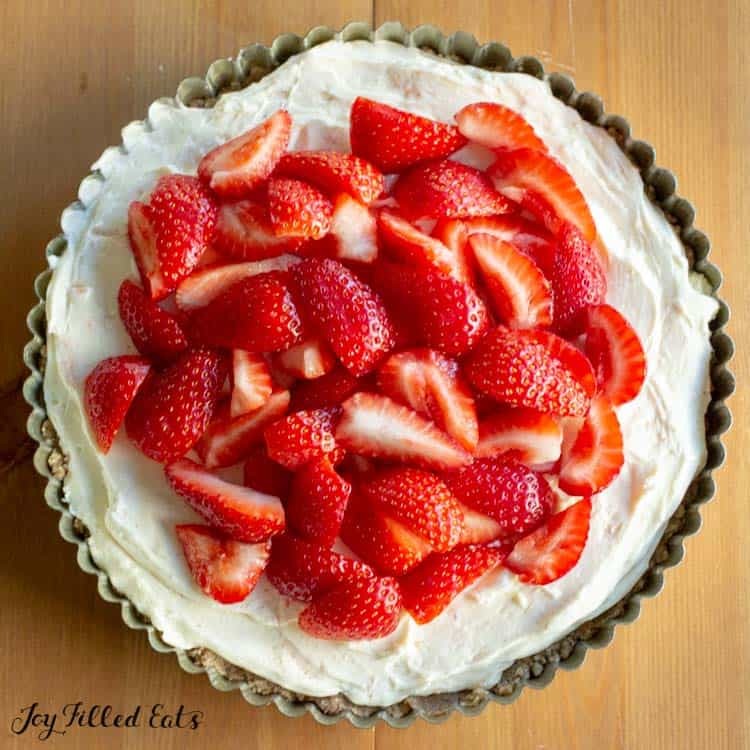 I decided to keep this strawberry tart recipe easy by making it no bake and just using 5 common ingredients. I brought this to a friend’s house and no one could believe it didn’t have sugar in it. That is a successful recipe in my book! What makes a tart a tart? The shape. You need a tart pan to make a tart. 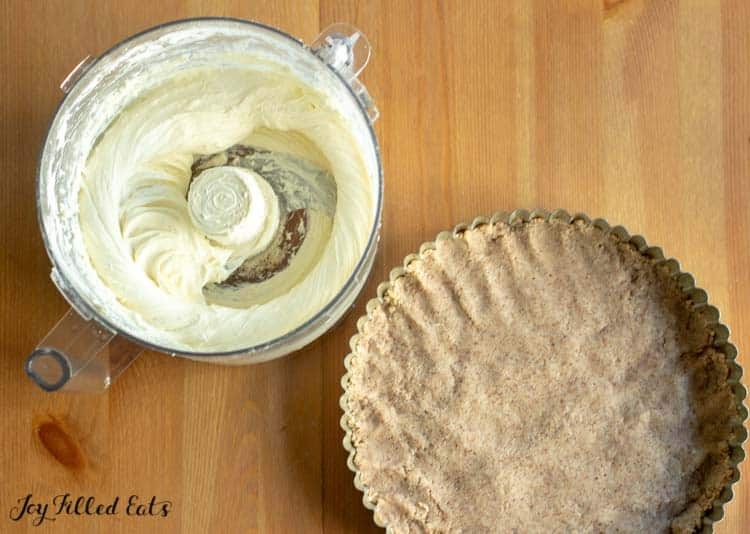 A tart pan has a removable bottom, similar to a springform pan so that you serve it without having to transfer the whole thing to a serving platter. Tart pans, in general, also have fluted edges. You can use any shape tart pan, sometimes the rectangular tart pans look fancier than a round pan. You can even make this into mini tarts. And then you need a crust and a filling. 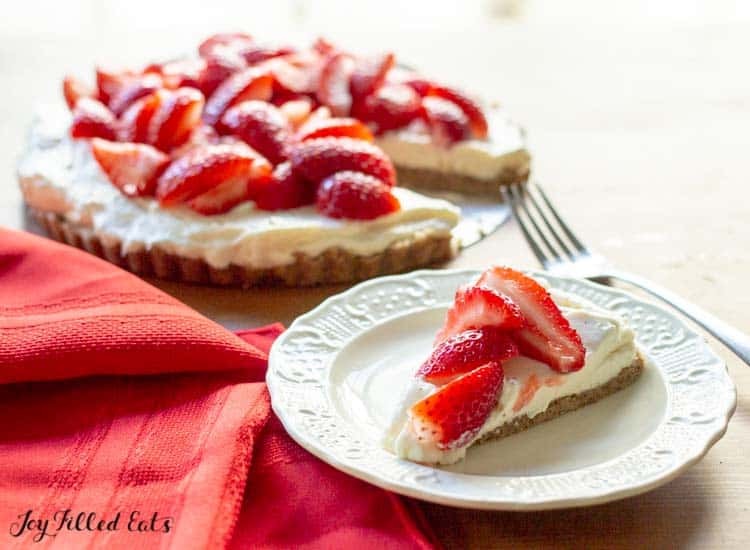 I chose to use an almond flour crust and a cream cheese filling for this Strawberry Tart Recipe. 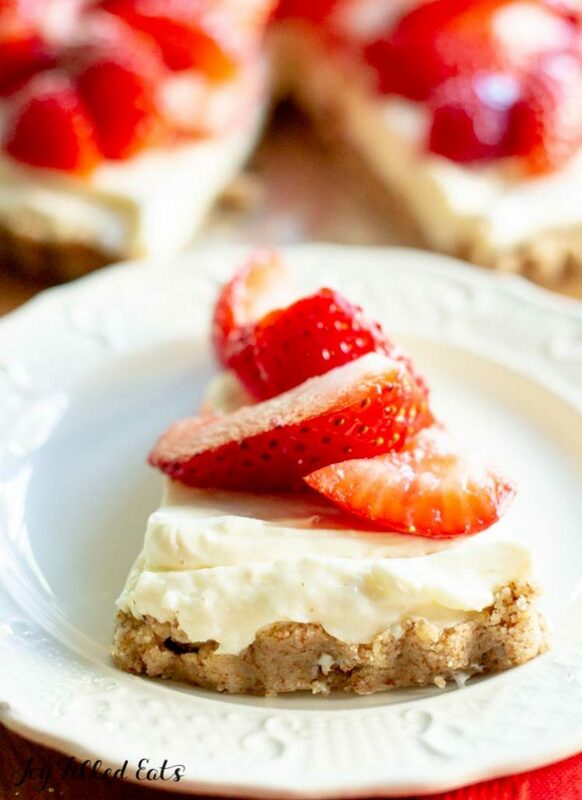 The first part of this easy Strawberry Tart is the almond flour crust. 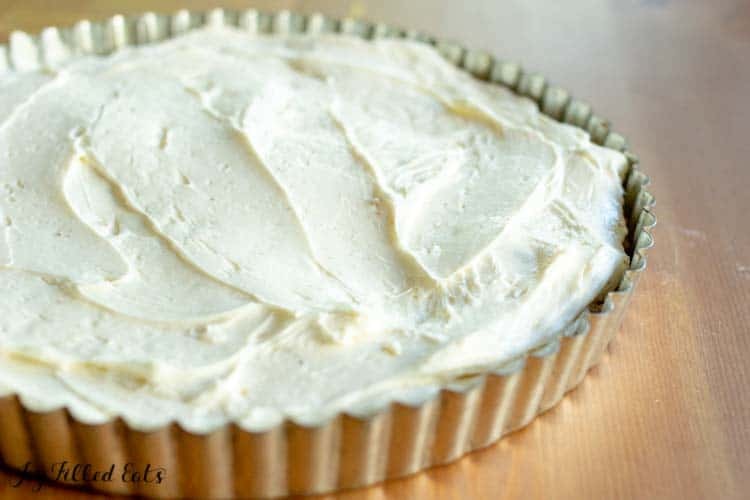 I use an unblanched almond flour in this recipe because it looks more like a traditional graham cracker crust than using blanched almond flour. Unblanched almond flour has the same texture but they don’t remove the skin of the almonds because processing them. You can use blanched almond flour, grind your own almonds for this recipe, or use almond meal. 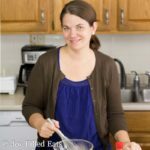 Since almond flour has become more popular over the last few years it isn’t much more expensive than almond meal. There used to be a much bigger difference in price. I love cream cheese. I could probably eat a block of cream cheese with a spoon. Anytime I do anything with cream cheese I need to take a bite. I bought low carb bagels recently and they were really just a vehicle to get the cream cheese into my mouth. The only thing better than cream cheese is cream cheese filling. Just adding a little sweetener to cream cheese is really all it needs. And that is all I used. Just 2 ingredients to this luscious tart filling. If you would like a firmer crust you can add a tablespoon of powdered gelatin. This will help the crust set. Or you can go ahead and bake the crust to dry it out a bit. We didn’t mind the moist, buttery almond flour crust as is. 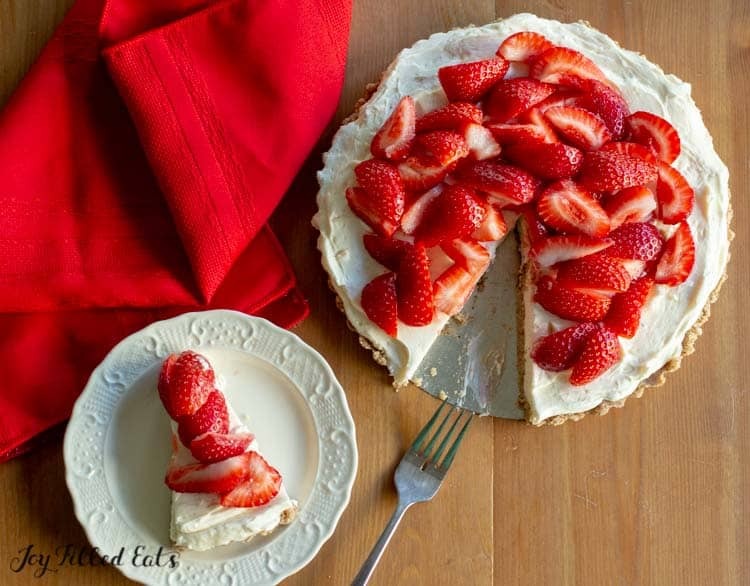 I was able to cut and serve the slices of strawberry tart with a large knife. No prob. Add half a teaspoon of lemon extract and swirl in 1/4 cup of raspberry puree (just thaw frozen raspberries). Add 1/2 cup of peanut butter to the cream cheese filling and leave off the berries. Add a teaspoon of cinnamon to the crust and use finely ground pecans instead of almond flour. Mix 1/2 cup sugar-free chocolate chips into the filling and garnish with a sprinkle of cocoa powder. Also on a strawberry kick? Make sure to try my Fresh Strawberry Jam, Strawberry Ice Cream Recipe with Ricotta and Keto Pound Cake Strawberry Shortcake! Combine the crust ingredients in a food processor and pulse until a smooth dough forms. Press into the bottom of a 9-inch tart pan. Add the cream cheese and sweetener to the food processor. Pulse until smooth. Spread on top of the crust. Top with the strawberries. Chill for 2-3 hours before serving. 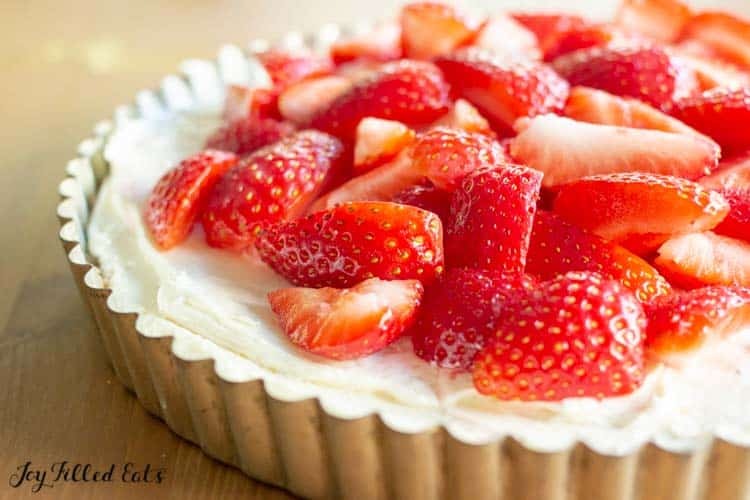 *** If you are counting macros you probably want to only use 2 cups of strawberries on top of this tart. I do not count macros on Trim Healthy Mama so I used about 4 cups on mine. This tart is so pretty and so delicious! My favorite part is the almond crust!